A New way to pay for parking! 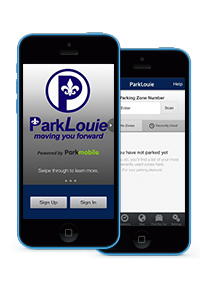 We are pleased to offer a convenient way to pay for on-street parking in St. Louis with Parkmobile! Drivers can now conduct their parking transactions by mobile phone. WE’RE CHANGING THE LOOK OF ST. LOUIS WITH NEW TECHNOLOGY! Look for the new ParkLouie decals on the meters. ParkLouie will be rolling out its service throughout the city. Be sure to look for specific zone number displayed on the signs and meters. To set up your account: download the app to register for a Parkmobile account. You will need your license plate number and a method of payment (credit card, debit card, or PayPal). If you do not have a smartphone, call the toll-free number on the green Parkmobile sign. When you park in a metered space, use the Parkmobile smartphone app to access your account, or call the toll-free number on the sign. Key in your zone number located on the signs in your parking zone. This number is different for every parking zone in the city and can be saved in your account. Opt-in to have Parkmobile send a text 15 minutes prior to the expiration of your parking transaction. You can either add time or get back to your car on time. All transactions are real time. You cannot prepay for or reserve parking. You must be parked in a metered space to begin your parking transaction. Parking can be purchased in increments up to the two hour maximum time limit. If you need to be parked for more than two hours, we recommend off-street parking. Start using the new parking meters today. It’s easy! Want to get a message to us about ParkLouie?